Triund hill is a perfect place to camp in summer. Camping near Dhauladhar range does have all the excitement. The bonfire, mountain packed food and instant noodles, all this will add up to your enjoyment. Camping on Triund Hill is a perfect weekend expedition for a night stay on the hill. Reach there with an easy trek, suitable for first time trekkers. The best views of sunset and sunrise is some you can't miss out. It could windy and chilly at night, so camping with the right gear is important. You must ditch the hotel stay in Mcleodganj for this accommodation. Planning for a weekend away from the hustle and bustle of the city? 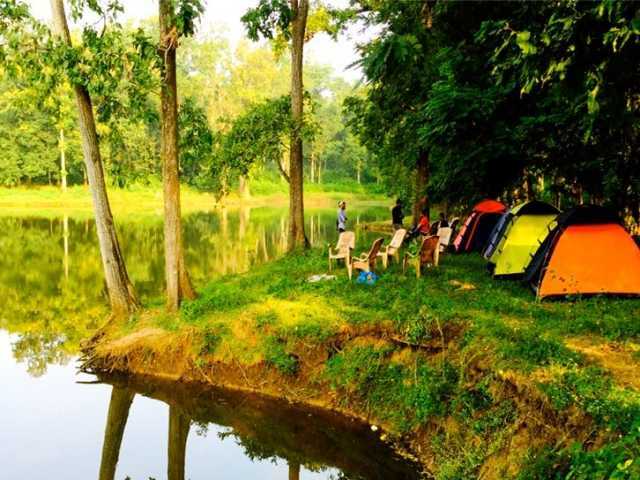 The best place is the Dandeli jungle camp. Hit the pause button in your hectic lifestyle and take a break in the luxurious surroundings of the Dandeli jungle resorts. Even as you drive past the fringes of the reserve forest area, you will feel your stress and strain slowly draining away. What better way to spend a long weekend, than in the jungle lodges of Dandeli? You can drive down to Dandeli via road or take a flight or train till Hubli and then taxi down to this town. When you book in to the Dandeli jungle camp resort, you can choose from two modes of accommodation. You can either stay in one of the cozy cottages or rough it out in a tent. Badagran is a small village in the Dauldhar Mountains. The campsite is at the most exotic location of the valley, near to the UHL river and surrounded by the hills, the best basecamp for the Treks to Kullu and forest experience. The tents and accommodation is comfortable and warm with shared washrooms for the trekkers. You could also enjoy the nearby sights and adventure activities such as rock climbing, rappeling and river crossing. Staying here will give you the chance to experience the village life as the camps surrounded by the cabbage fields and situated near to the 2 hamlets(Badagran and Nalhota). The easiest way to reach camps is the road from Barot. The camp in this sleepy Himalayan town with some of the best snow peaks views is walkers dream strewn with meadows, jungles and temples. You will find yourself standing into a sea of mountains from where everything is falling around. You can enjoy blossoming orchards in spring, and succulent peaches apricots and plums in summer though winters are very cold. Apart from enjoying the seasonal surprises, changing beautiful colors of clouds you can also experience rock climbing/rappelling at the cliffs, deep jungles for explorations in night jungle safari, basketball and archery at the camp, fruit picking, a bath under water fall, dance on local live music and your camp team can even take you around their villages for a friendly Himalayan meal. The place will not disappoint bird watchers. You can also buy the delicious Apple Jam and Apricot chutni. Camping in Barot along Uhl river is the most popular family and corporate weekend getaway activity for tourism from Punjab, Haryana, Chandigarh, and Delhi. Camping in Barot would be the best camping experience to relax near nature far away from the city noise. Barot is in the lap of Kangra valley set among the lush green forest of Pine, Oak, Deodar and Rhododendron. You can enjoy the tranquil weather of Barot alongside Uhl river. The natural surrounding of river, thick forest, waterfalls will make your day memorable. Beautiful and captivating environment and camp life will make you feel like the love and pleasure of lying in the lap of Nature. Not just the peace, camping here will bring many adventures for you such as river crossing, rappelling, rock climbing and try your hands at trout fishing. Camping and Trekking both activities go hand to hand as far as Great Himalayan National Park is concerned. Camping amidst the creepy-crawlies of nature is an exceptional experience. The forest is exceptionally beautiful, especially as it grew unhindered and lush green around the Tirthan River. There are a few designated camping sites in high altitude pastures. Your local guide will be of help in selecting a place to camp, which is close to water and safe for the night rest. The best suitable time for camping in GHNP is April, May, June, September, October, and November. The best thing to enjoy at Lambasingi is the chilled temperature that may drop to 0 during the night hours. Camping the best accommodation that you will have in Lambasingi. The overnight camping experience with music and bonfire is an experience you can recall about many times after your trip. However, it is advisable to carry your own tent and supplies, do not depend upon the village shops. The nature camping in Araku is ideal hotspot for the adventure seekers. 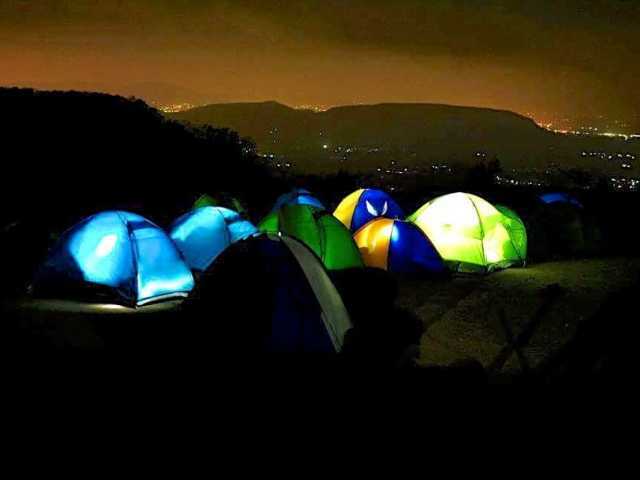 You do not travel far to Western Ghats or Himalayas to enjoy the amazing night camping experience. The fun is right here near you. The nature camp has facilities for rock climbing, trekking, bird watching and target shooting with bow & arrows. This eco-tourism destination is home for a variety of animals and birds. With the help of naturalists or guides in the camp, one can learn the language of the jungle, identification of calls, marks etc. There different camp sites in the tourism zone of the national park. Most of them are near to the lodges and resorts. In the pristine and peaceful surroundings, the thill of the wild makes this camping different from the one in mountains. Few of the campsites are dedicated for students for the school/college educational tours. It is said that wildlife trip to India is incomplete if you have not visited Dudhwa Forest Lodge. A place located right at the heart of the national park in the tourism zone of the park. Dudhwa national Park is among few national parks that allows night stay for tourists in the wildness of the Jungle.